Shin Splints also called the medial tibial stress syndrome is the problem of pain due to inflammation of the tendons, muscles and bone along the inner edge of the tibia also called the shin bone. It is an exercise related problem caused due to overuse. This pain usually develops after a physical activity especially running. Any rigorous sports activity can result in shin splints mostly in the beginning of a fitness program. Buy high quality products from top manufacturers like Medi Dyne, BMMI / Medical Magnetics, Brown Medical and many more at best prices on HPFY! How does a shin splint feel like? How can shin splints be diagnosed? How long does it take for shin splints to heal? What is the difference between Shin splints and stress fractures? 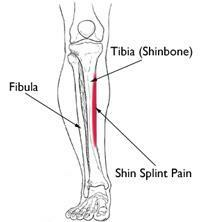 What causes shin splint pain? Shin splint pain can be alleviated by taking the RICE treatment. Rest is essential for the pain to subside. Overworking the muscles will only cause increased pain and discomfort. Icing the injury can help in soothing the pain. Apply cold packs like Sealed Ice Shin Ice Neoprene Sleeve to the injury for the first 24-48 hours for not more than 20 minutes at a time, 3 times a day. OTC topical pain relievers like ARI Medical Flexall 454 Maximum Strength Pain Relieving Gel may also provide relief from the sharp pain. Compression therapy helps in reduction of inflammation and improves blood flow. Try the BMMI Shin Support for providing the required compression to the shin splint. Elevating the injury helps in improving circulation and provides for faster healing. Therapeutic heel cups can also help in providing cushioning under your heels thereby relieving pain. Try the Medi-Dyne Tulis Classic Heel Cups for therapeutic benefits.